Calgary Bucket Truck Training - The bucket truck training program is a program which is intended to effectively train operators who are qualified so they could decrease the chance of personal injury and incident while working in close proximity to or with bucket trucks or likewise referred to as vehicle-mounted aerial work platform. An aerial lift device is any vehicle-mounted device, articulating or telescoping, or both, which is used to position personnel to reach spots which would otherwise be not accessible. Aerial lift devices are utilized in order to elevate workers to above-ground work locations. 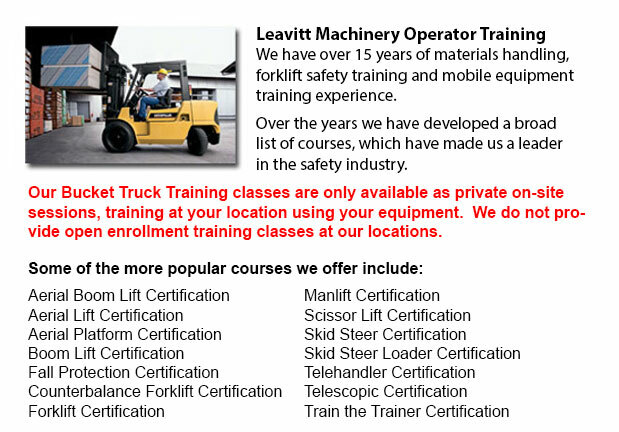 The program aims to provide operators with the knowledge, skills, training materials and abilities required to safely and efficiently operate vehicle-mounted aerial work platforms. The program has two parts: a classroom training session and a hands-on training session. To be able to become certified, participants have to be successful in both components. A wallet-size certificate and a full-size certificate will be given upon finishing the program. Types of lifts consist of extensible boom platforms, articulating boom platforms, vertical towers, aerial ladders and aerial ladder trucks and any combination of these devices. Aerial lift devices are often made of wood, metal, fiberglass, reinforced plastic or other materials. Articulating boom platform: multiple hinged boom components. Extensible boom platform: has an extensible or telescopic boom. Platform: section of the aerial device which is designed to carry staff. Mobile unit: a combination of aerial devices, including its vehicle and related equipment. Workers who work with aerial devices have the responsibility of making certain that they are correctly authorized and trained. Employees must make sure that individuals who are not authorized and trained do not utilize lift devices. Employees should ensure that they wear the correct protective equipment when working from the platform. The course content used in the bucket truck training program includes operating the vehicle-mounted aerial work platform, safe operating practices, pre-shift inspections, use of emergency controls, lifting capacity, and administering practical and theory tests. Operators will be familiar with legal requirements under the federal and local regulations.